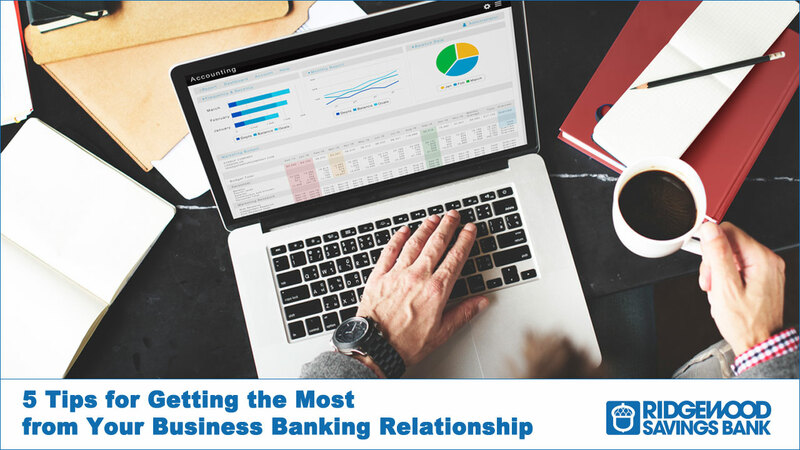 Whether you are just starting a new business, have been at it a few years, or have been "running your own show" for more years than you can remember, having the right banking relationship can provide many benefits and help your business grow and prosper. Here are 5 tips from the Business Relationship Managers at Ridgewood Savings Bank, the bank that has been "multiplying the good" in your community for over 95 years! Ensure that you are working with a Business Relationship Manager (RM) who really knows you, understands your business, is knowledgeable about your industry, and is committed to helping you succeed. A good RM is your advocate within the bank, helping you navigate the many products and services available that work best for you and your business. They can help obtain a loan, choose appropriate cash management products and provide solutions for your everyday needs such as payroll and credit card processing. Utilize your RM as a trusted advisor. When utilized properly and for the right reasons, borrowing money can be a key strategic tool for taking your business to the next level. Whether you need a short term credit facility to supplement your daily cash flow or a long term loan for equipment purchases or other capital expenditures, your bank can be a helpful partner by providing a variety of credit facilities. Your RM can advise what a lender typically looks for when considering a credit request. Idle cash sitting in a non-interest bearing account represents a drain on your profitability; it can be put to use in a variety of ways without hurting your liquidity. FDIC insured Business Savings accounts offered by your bank represent investment options that are secure, pay a market rate of interest, and keep funds readily available when you need them. (FDIC insurance limits apply.) Many business owners realize that it pays to "prepare for the unexpected"; maintaining extra cash in a liquid investment account can have a big pay-off when the unexpected happens. Take advantage of the many cash management products and services offered by your bank. Many of these products have been designed specifically for small businesses and are offered at no cost. You can use "Online Banking" to monitor your account balances and transaction activity, pay bills online, transfer funds between accounts and receive account alerts. You can deposit checks without visiting a Branch by utilizing a "Remote Deposit Capture" product. Learn about the features and benefits of these products by speaking to your RM and leveraging his/her expertise to help your business operate efficiently and grow to new heights! Ridgewood Savings Bank is the largest mutual Savings Bank in New York State, with assets exceeding $5 billion. We have been providing traditional banking services to local communities for over 95 years. At Ridgewood, we have a team of Business Relationship Managers who are dedicated to helping your business grow and prosper. Our Team takes the time to get to know you and your business, and they take pride in serving as trusted advisors. Visit www.ridgewoodbank.com or call 844-RSB-4SBB to schedule an appointment with a Ridgewood Business Relationship Manager and discuss how they can help your business continue to grow. Member FDIC. Equal Housing Lender.